Snow in April this year. As winter finally recedes, spring is time to think about a handful of the hardiest of the hardy garden plants that will stand up to wonky upstate spring seasons. When nature dishes out snow and hard freezes, these perennials can take it in stride. You want tough plants that look beautiful in your garden? Get chives, iris, bee balm, daylilies, and sedums. Every single one of these perennials emerged in Zones 4 and 5 before the snow, and were unfazed by the cold temps and blustery winds. Chives (Allium schoenoprasum) laugh at snow when they start to emerge in February. Check it out for yourself. In the fall, leave the plant to brown and die back. 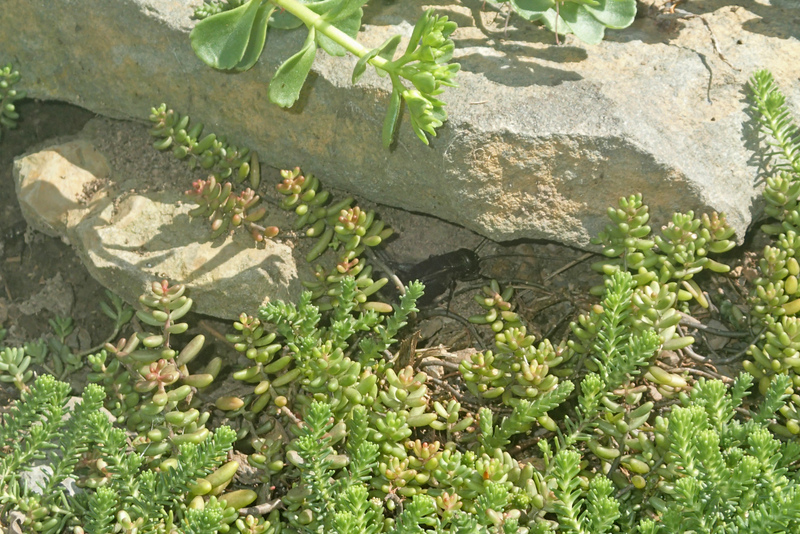 The dead foliage helps to overwinter the plant and protect it. In mid-February, peel back the brown to witness the new young green shoots coming up. In our region, the round purple flowers bloom in May, adding really early color to your garden. Plus, they do double duty as critter repellants when inter-planted and you, the human, can snip some for your eggless Sunday morning scrambles. Iris germanica and iris versicolor come up early. 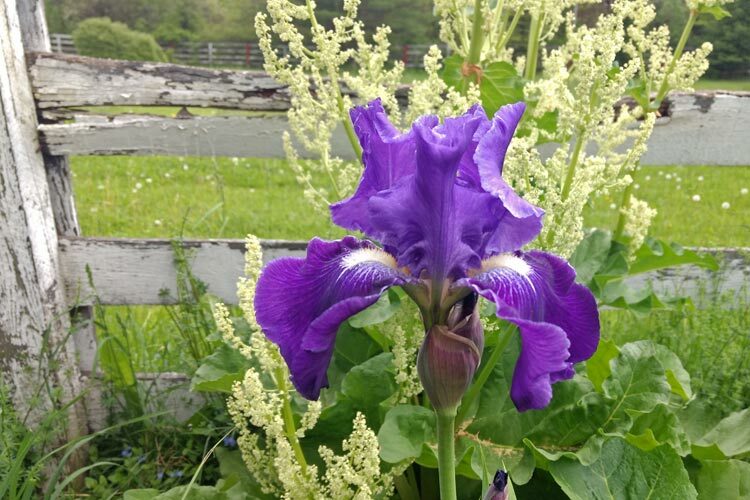 Bearded iris have the gray, sword like foliage that deer dislike. The foliage of native iris versicolor also resembles a sword but is taller and thinner. Both of these plants enjoy full sun to part shade. Provide Iris versicolor with consistent moisture. This guy can also handle the margins of a pond, submerged from one to three inches of water. You’ll notice the rosettes of bee balm (Monarda) leaves laying low to the ground almost as early as chives. A member of the mint family (notice the square stems), bee balm can take cold like a champ. It will also run freely through garden beds, so once you buy a plant, you will never, ever have to purchase another. Better yet, ask a friend who gardens to dig you up some bee balm for free. 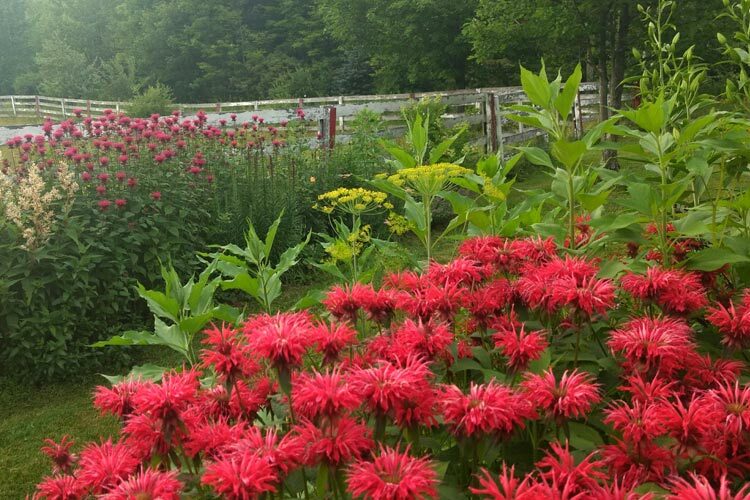 Most gardeners have an overabundance of bee balm and are happy to share. Some favorite bee balms are the native scarlet bee balm (Monarda didyma ‘Jacob Cline’), purple wild bergamot (Monarda fistulosa) and the cultivar ‘Raspberry Wine’. 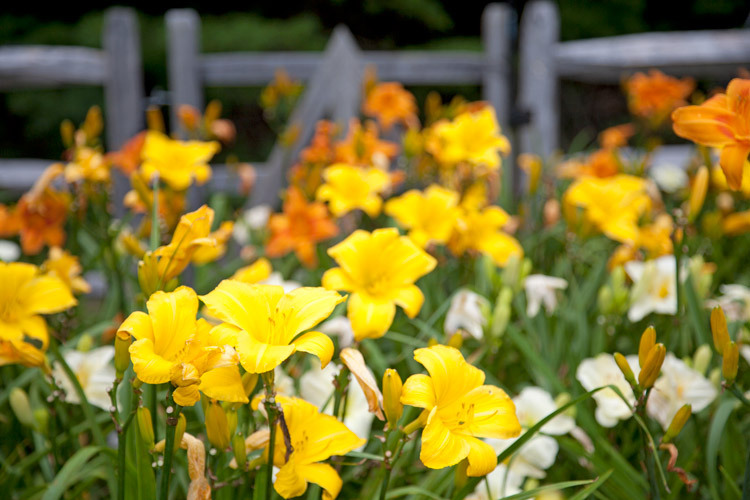 Daylilies (Hemerocallis) come in a wide variety of colors. Full sun and pretty consistent moisture is best but – these perennials will thrive just about anywhere except shade. I’ve seen the common orange one planted roadside and despite year after year of heavy salting, come up and be sprightly and beautiful. Not native but very reliable as an accent or swath and for tough areas like roadsides and driveways. Sedums emerge early and are undaunted by cold or snow. Full sun. Can handle drier soils. The one found in most gardens is ‘Autumn Fire’ stonecrop. The plant really does its thing in late summer and early autumn, one last shot of color in the garden, but even before it blooms, the bulk and lime-y green of its stems and ripening cabbage-like flower heads offer lush structure to any perennial garden. Having these plants nearby helps alleviate the pain of spring forestalled. If they can do it, so can you!